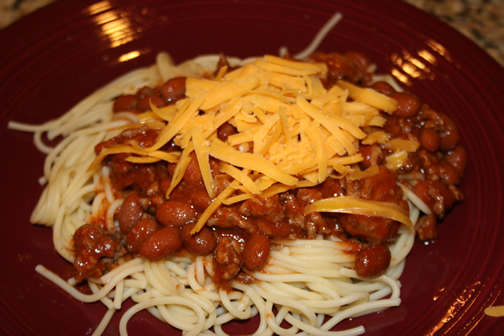 This recipe is also known as Cincinnati Chili or Five-Way Chili. We often make it the same week we make regular chili to get double the use out of our chili recipe. On each plate, put a portion of cooked spaghetti and top it with heated chili. Top with shredded cheddar cheese and chopped onion.